FestiFools 2010 in full swing. 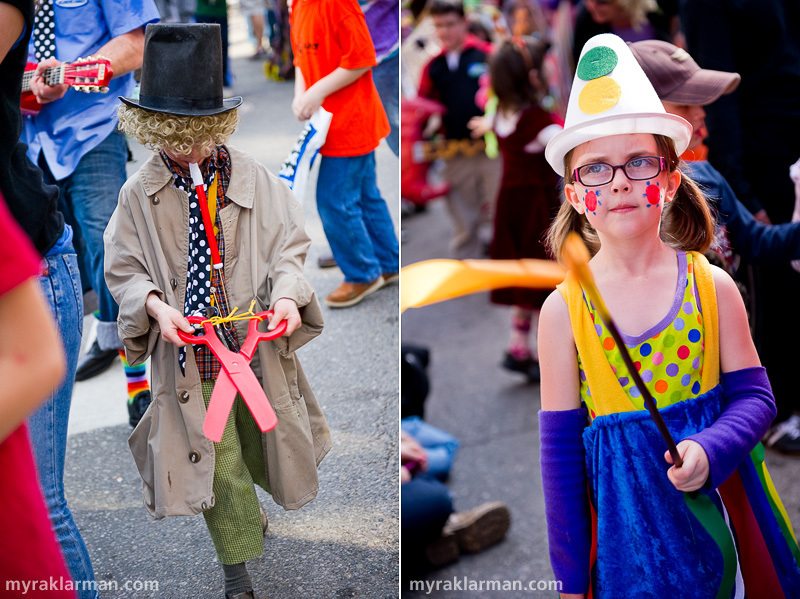 This (the 4th annual) FestiFools was the best yet for our family, and I hope it was the same for you and yours. Rico made me buy the most perfect cyan, patent leather Dr. Martens, which became the inspiration for the rest of my outfit. 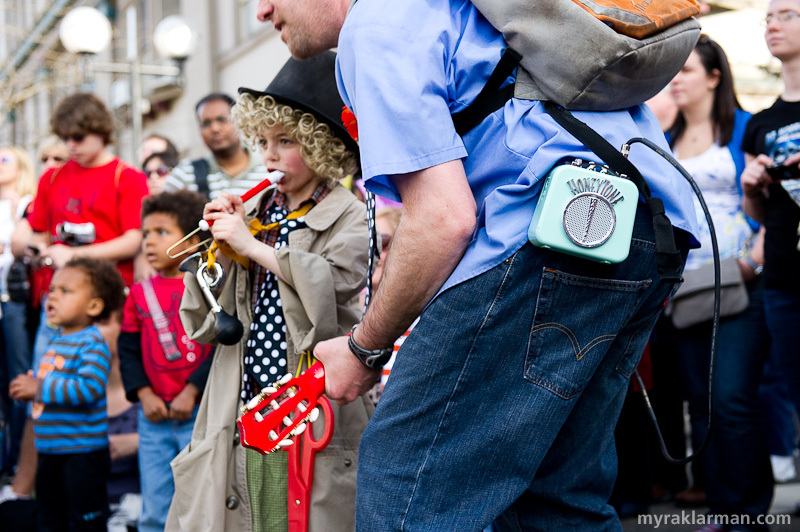 Max told us last fall — you read that right: last fall — that he wanted to be Harpo Marx for the next FestiFools. We tried to sell him on a few shortcuts (“A wig will be itchy,” we explained). But he was unshakably committed to his vision — and the jumbo, red scissors were absolutely non-negotiable! I hope you saw him because he truly was Harpo. 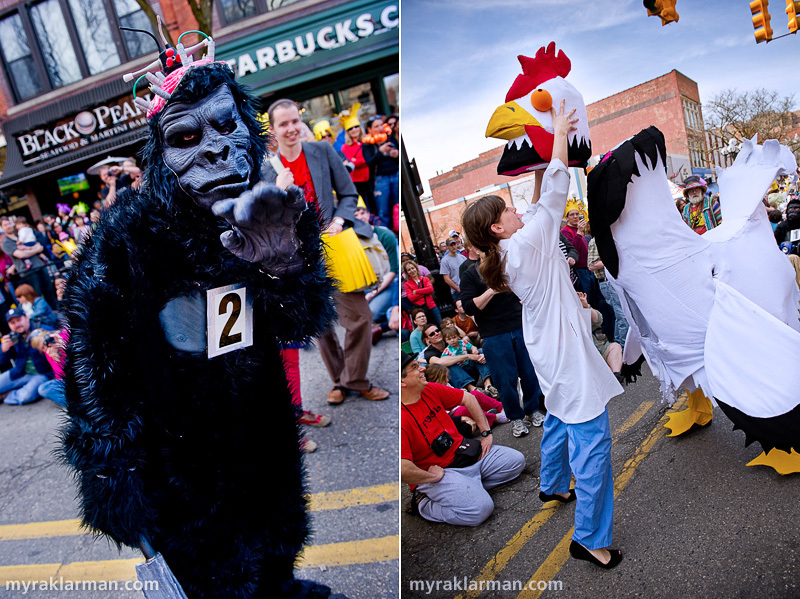 He and Rico tore up and down Main St., making all kinds of vaudevillian mischief. 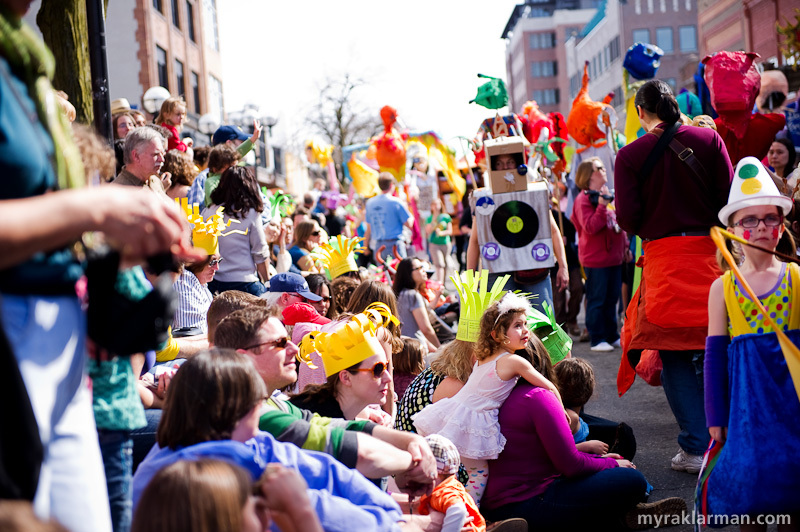 All indicators strongly suggest that FestiFools has attained a critical mass of love in the community. 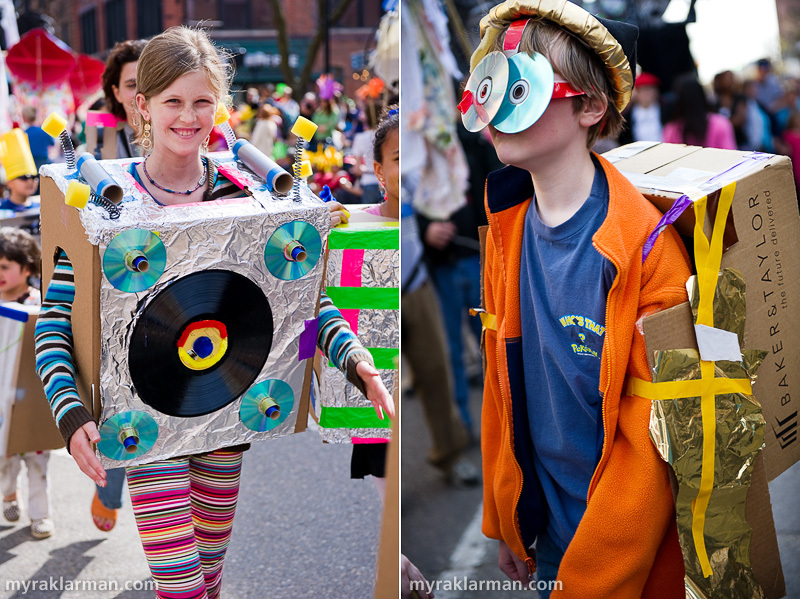 Every media outlet within 50 light-years of Ann Arbor was talking up FestiFools. 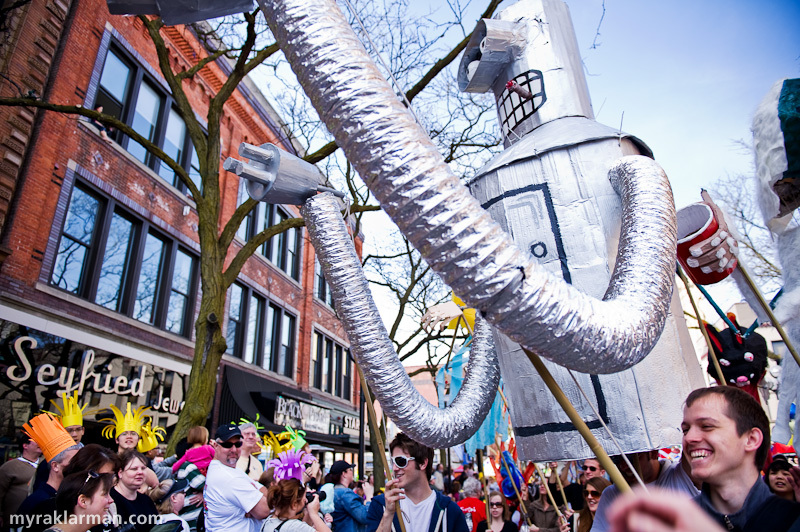 Each weekend, the FestiFools studio was crawling with industrious community volunteers either undertaking their own puppet projects, or assisting U-M students with theirs. 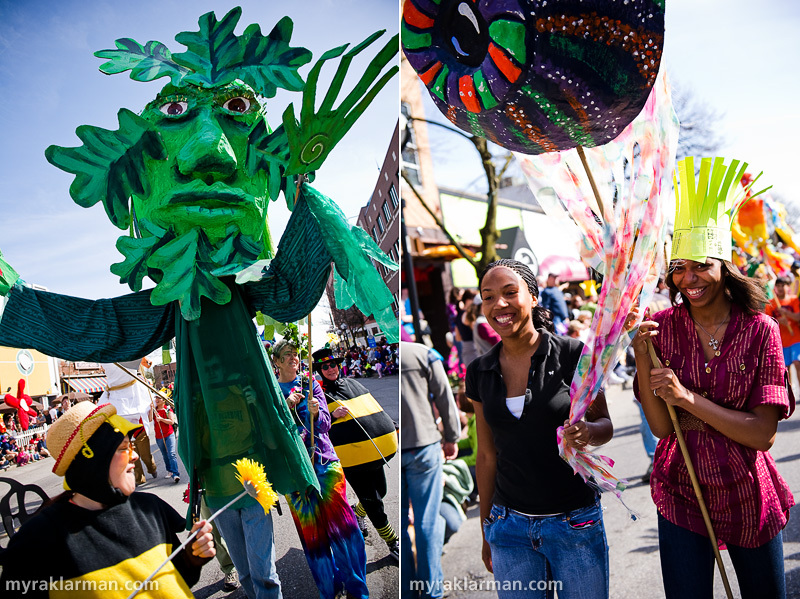 I know of at least two local elementary school groups who made their own space-alien puppets and brought them to life on Main Street. 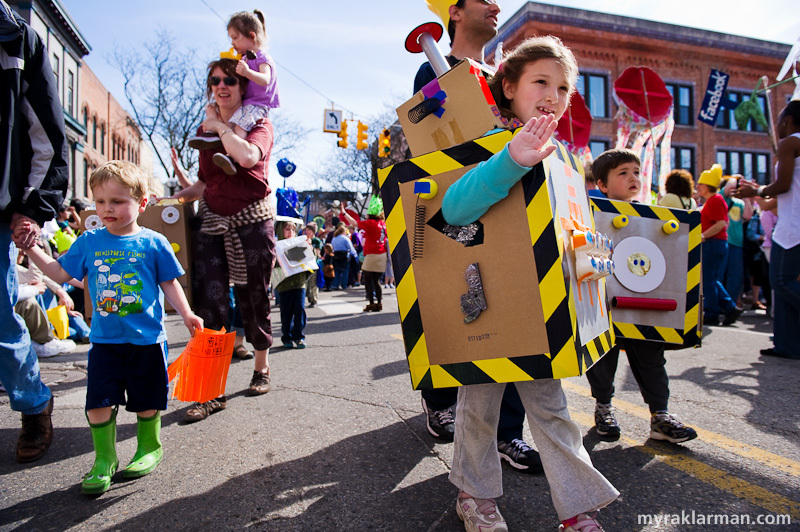 This year 826michigan teamed up with the AADL to offer an expanded and retooled “Robot Invasion of FestiFools.” Because of all that and beautiful weather (a million thanks to Mother Nature for hooking that up), we had the biggest turnout yet — by far! 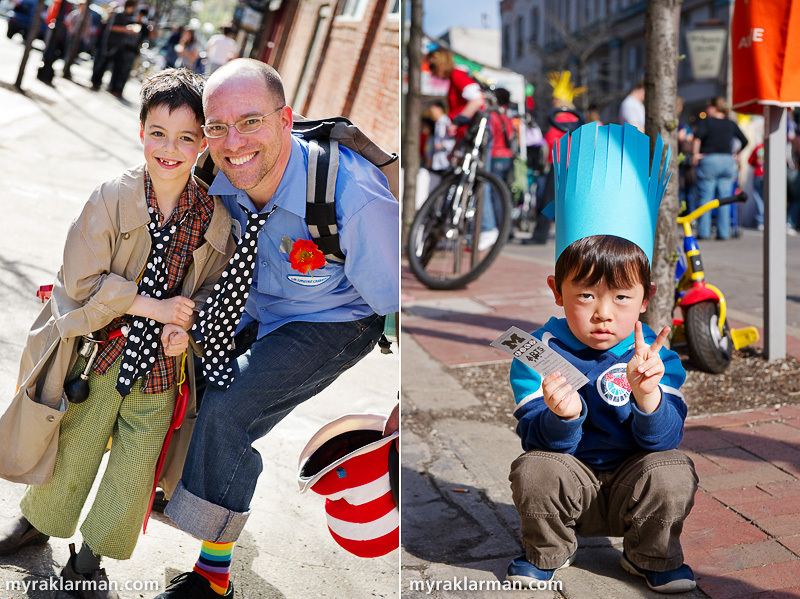 Finally, more than 1000 of the colorful, not altogether un-fezlike Frond™ hats were embraced (and often customized to great effect) by the FestiFools public. If you were fortunate enough to get one (or if you’re handy with scissors), this goofy headwear does much more than look cool: it also offers you delightfully Foolish incentives/opportunities/excuses to interact with 33 local businesses who love FestiFools as much as you do. I’m proud to say that the entire Frond thing — both the hat itself, as well as the goofy theater of it — was the invention of my husband, Rico, a member of the FestiFools steering committee. 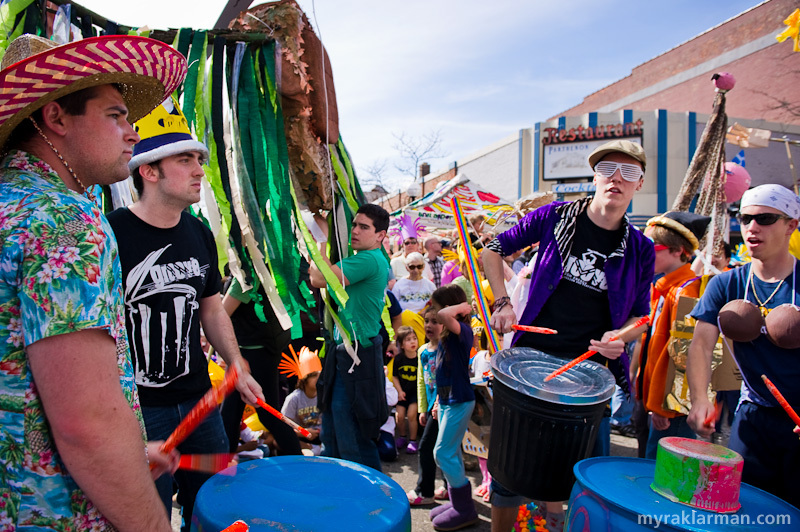 For years he’s wanted to broaden the event, extending it beyond the day of the street party. Because many of the deals are hilarious — and we can all certainly benefit from more hilarity in our daily lives — I hope you’ll consider taking your (genuine or counterfeit) Frond hat out for a spin. 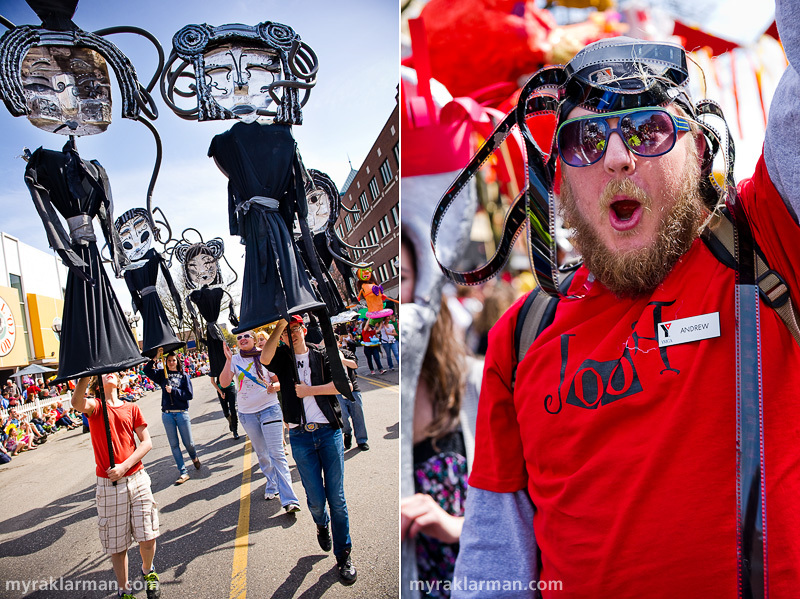 “Robot prongs engage!” Many FestiFools puppets are specifically designed to interact and make friends. 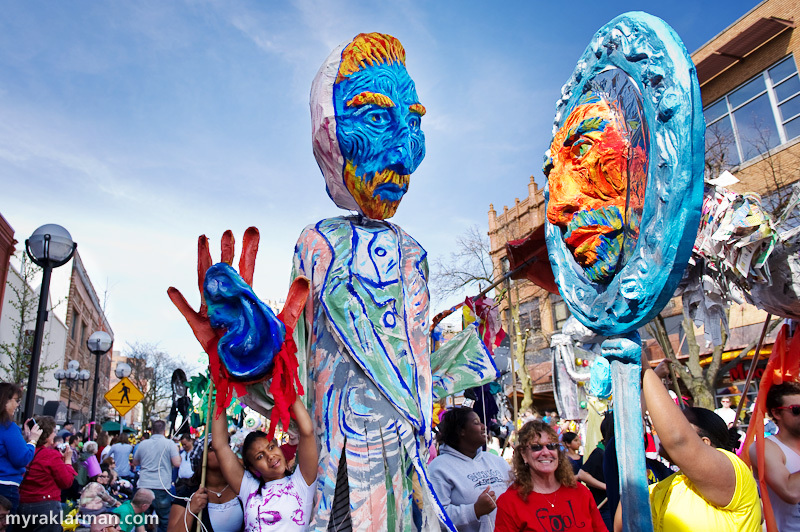 These papier-mâché puppets, created by U-M students Leslee Klein and Jenna Moore, take over Main St. | U-M student Joy Lerner helps us appreciate the scale of Rococo Man’s head. Right: Andrew Epstein, the YMCA Youth Volunteer Corps coordinator, brings his boundless energy to the event. Andrew arranged for his group of volunteers (ages 11-17) to spend two weekends working at the FestiFools studio. Left: Community volunteers Jeanne Mackey and Pattie Postel teamed up to design and create a giant puppet. Fifth-grade boys from Burns Park Elementary carry the alien puppet they created. 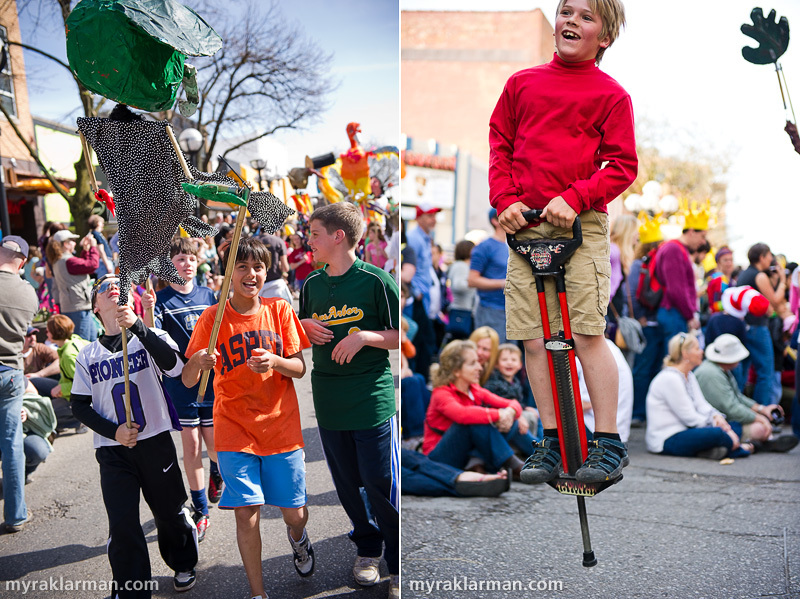 | Many “freelancers,” such as this young, pogo stick–jumping Fool, joined the party. 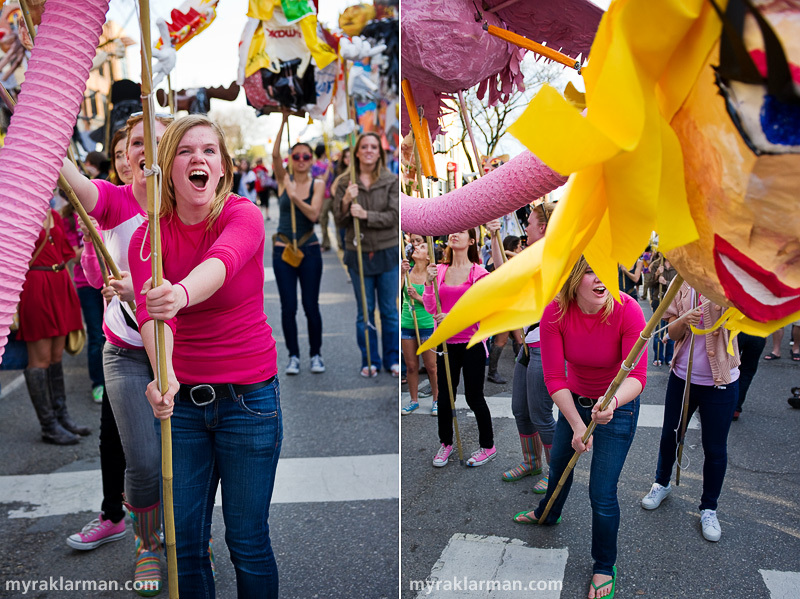 Thanks to fierce wrangling by this U-M student, this puppet would first stun the object of its attention with a loud scream, then swoop down for a closer look. 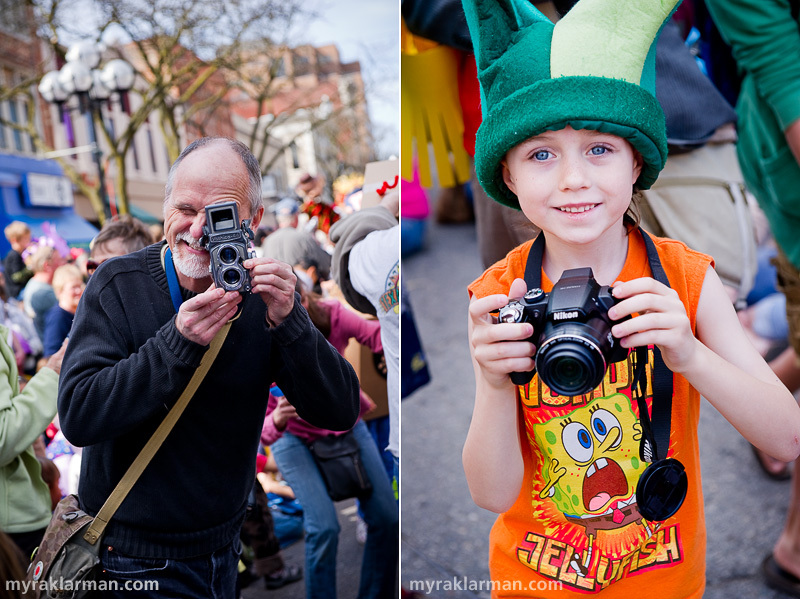 Of course, photographers love FestiFools. I even spotted a vintage Polaroid camera! Thanks once again to U-M student group GROOVE for the groov-a-licious beats. I love connecting the “dots” at FestiFools. | Fifth-grade girls from Burns Park Elementary carry the alien puppet they created. I wonder what this U-M student thought about that bacon-and-eggs puppet. 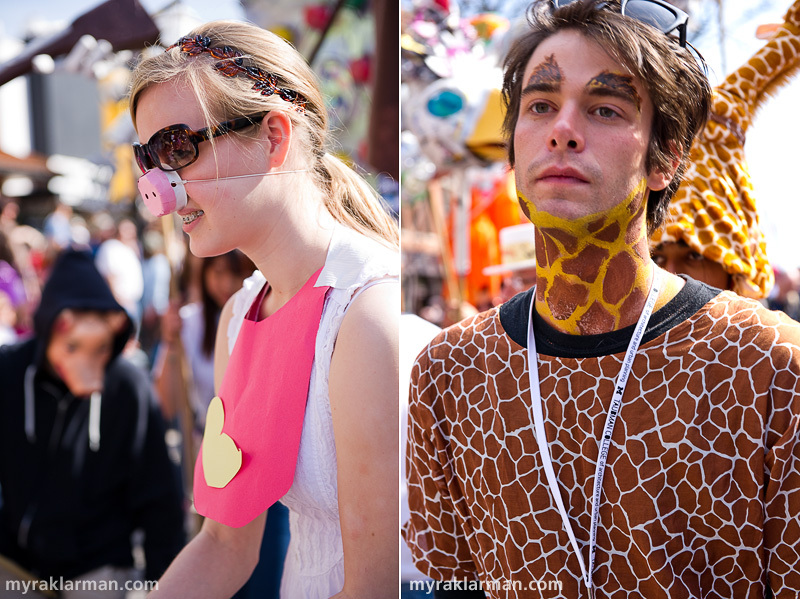 | This giraffe was masquerading as U-M student Gabriel Tourek. Watch out for Gorilla #2. He/she looks none too remorseful after viciously chopping off the head of a defenseless chicken. Max and Harpo are cut from the same cloth! Which reminds me: huge love to Lisa Gottlieb for expertly tailoring — at the eleventh hour, mind you — this adult-size trench coat to fit Max. 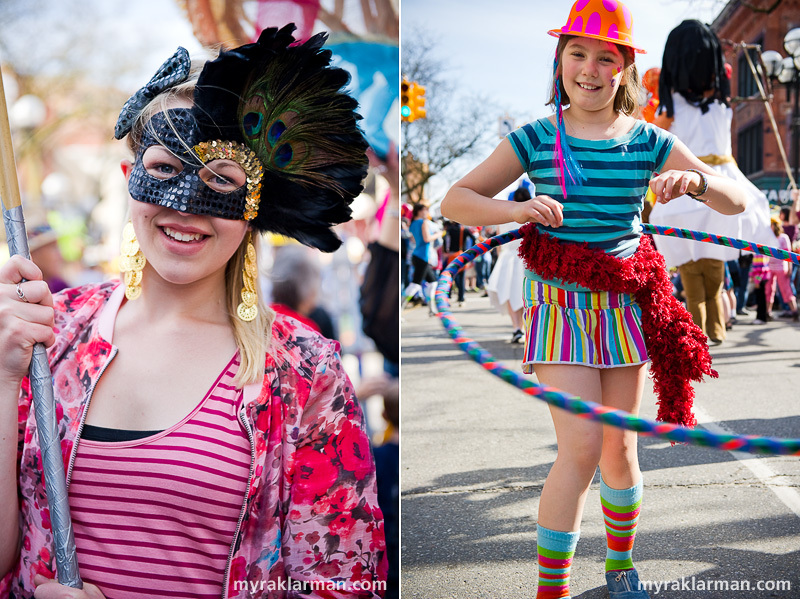 | Amelia Marx and her classmates from Summers-Knoll School were delightful additions to FestiFools. Mark Tucker, FestiFools’ creative director, customized his suit à-la–Van Gogh. He pauses for a photo with Sophia Michahelles and Alex Kahn’s back. 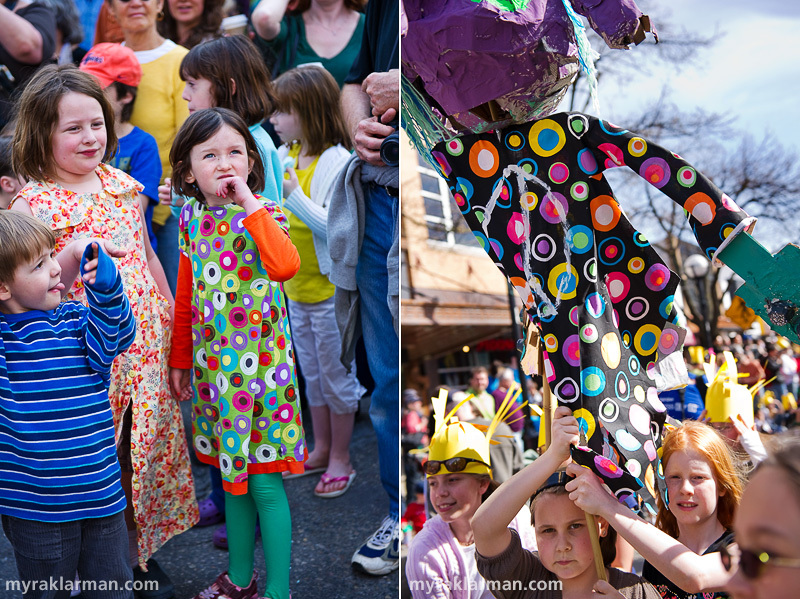 Sophia and Alex, of Superior Concept Monsters, worked with students and volunteers in the final days leading up to FestiFools. Pioneer High School student Alice Carlson carries a puppet she collaborated to create. | Grace Kaufer, a Hebrew Day School student who helped create several puppets, finds space to hula hoop. 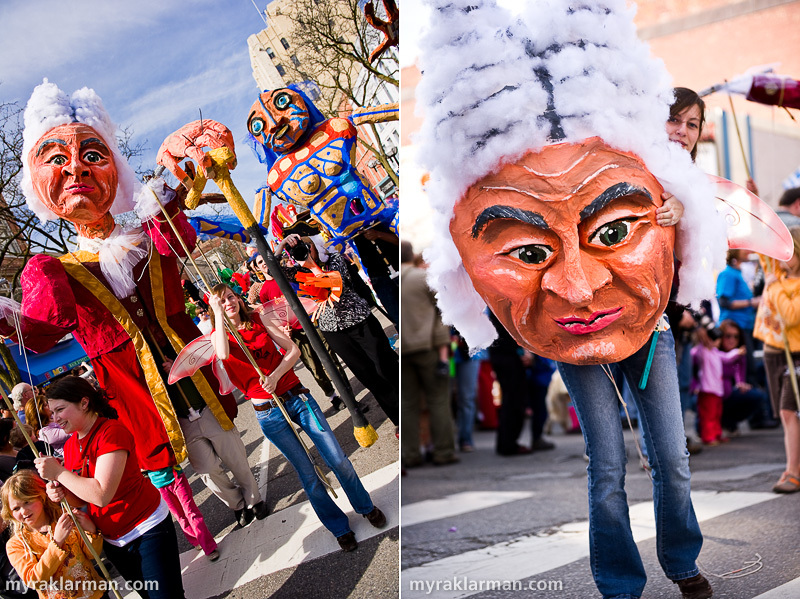 One of the elder-statesmen of FestiFools puppets (he was shakin’ his groove thing back at that very first street party in 2007) looks on approvingly at this year’s event. 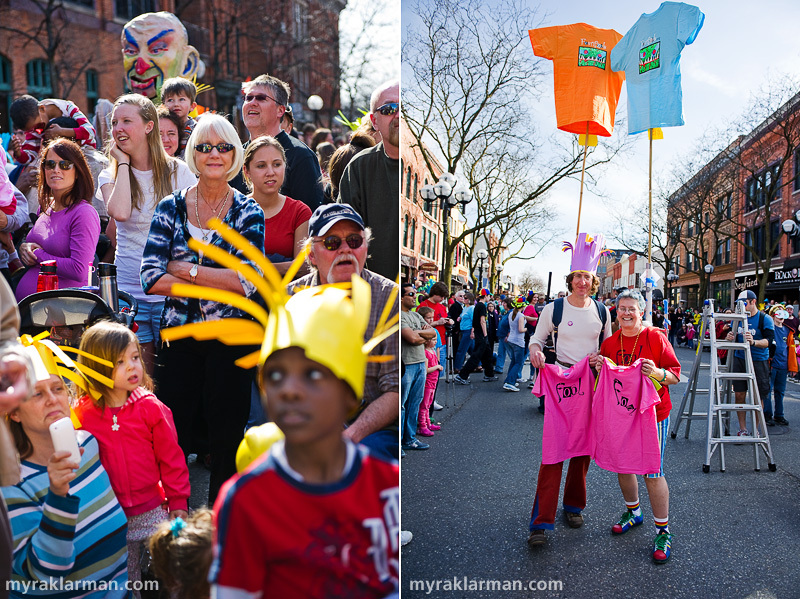 | Linda Lombardini and her son Jason Frenzel Wright are well-equipped to hawk FestiFools t-shirts. Winding down… Max and Rico take a break from running themselves ragged to watch GROOVE set up for their solo act at 5pm. Max and Rico are bursting with a post-FestiFools glow. | And don’t forget that your (genuine or counterfeit) Frond hat is your passport to bliss (or at least to somewhat absurd deals). Peace out till next year. sa-weet photo shoot, as usual Myra. There is photography, and then there is Klarmanography: with a million fun little details tucked into every inch, all popping with un-believable colors bouncing off each other. I wish my eyes worked as well as your camera! Oh, and the fest was fun too!! Awesome!!!!! I was in that parade! it was soo cool! 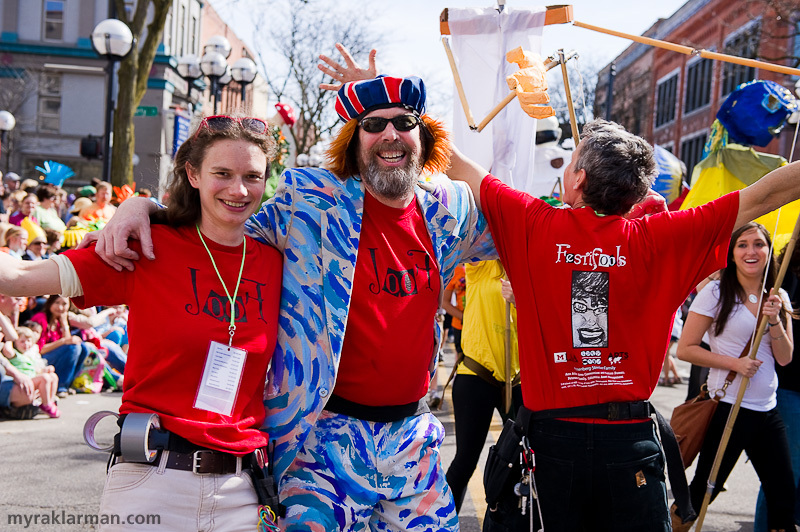 Myra, as always, your fabulous pictures caught the energy and the fun of the FestiFools so that again we all know how great it is to be in Ann Arbor. Keep ‘em coming! I’m cool with “Myrography” too! Let’s get it in Wikipedia! !